Achievement and Dean's Honour List standings. 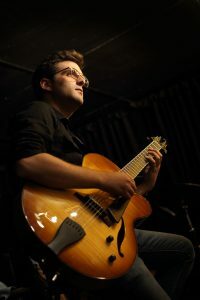 He has also been the recipient of several awards and scholarships including the Oliver Jones Jazz Scholarship from Vanier College, the David Moyse Guitar Scholarship from McGill and an Artist Development Grant from FACTOR. Sam is very active in the Montreal jazz scene, with several weekly residencies and frequent appearances as both a leader and sideman at the city's major jazz clubs. In April 2017, Sam released his first full length album, Opening Statement, on Montreal based label Chromatic Audio. A mixed set of originals and standards, the album features New York based pianist Sean Fyfe and Montreal stalwarts bassist Mike De Masi and drummer Dave Laing.